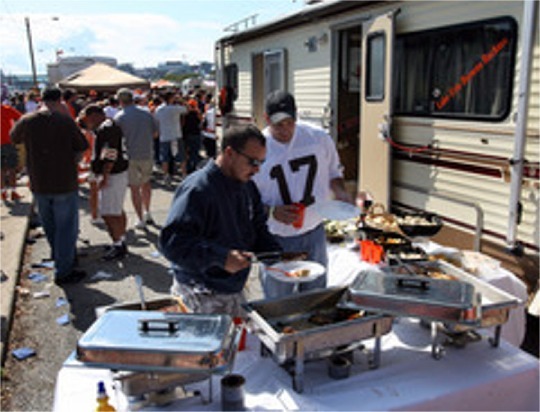 If you are preparing to take your RV to all of your tailgating events this year during football season, you need to ensure that you have the right camper accessories first. These are a few upgrades that you might want to make to your camper before you start tailgating this year. Coolers are great for keeping drinks cold, but for food safety and convenience, it's a good idea to have a nice, working refrigerator in your camper. Then, you can store hot dogs, hamburgers, chicken, condiments and yes -- sodas and beers -- without worrying. Even though the temperatures have cooled down, it still gets bright and sunny at most tailgating parties. Installing an awning is a great way to shield off the sun for your party, also keeping you comfortable while partying with friends and family. Besides having a few beers and rooting for your favorite team, the best part of tailgating is grilling out. So, you will need the perfect grill to cook all the food for you and everyone else. We have everything from gas, electric to charcoal and these grills are made to be portable so you can take them wherever you go. Since you are tailgating in your RV or camper, one popular grill would be a mountable one. The Outdoors Unlimited Sidekick Grill gives you the option of mounting it to the side of your RV or using the bracket as a table top stand, you choose. When tailgating there is nowhere to sit or eat, well we have the perfect solution, foldable tables and chairs. A folding table is great, it gives you a place to set all the food after it is cooked and an area for people to eat. It can also fold down compactly so it won't take up much room in the camper or RV. Folding chairs are also nice to have, they are also compact and give you the option to sit back, relax and enjoy being in the outdoors. If you are looking to be unique we have the folding picnic table. Fold it out to seat up to 4 people and when you are done it folds up, small enough to carry or store away. Outdoor games can make a tailgating party much more fun. Checkout the Fundex Bulls-eye Washer Game or the Picnic Time Football Bean Bag Throw, which are perfect for everyone. While watching or listening to the game, get a friendly competitive game of your own going. As you can see, there's a chance that your camper needs a few accessories if you want to make the most out of the tailgating season. If you contact us, we can help you find all of the parts that you need to hook your RV up for this football season.